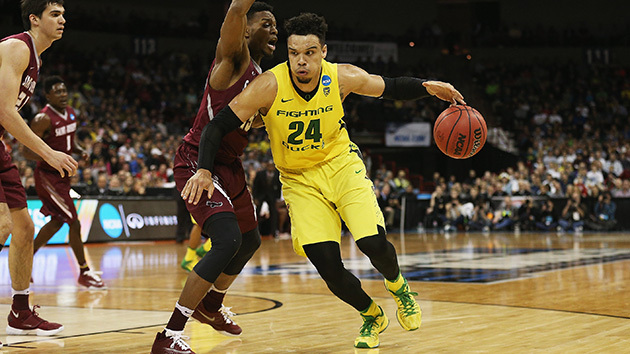 Everything you need to know about the Oregon Ducks as they head into the Sweet 16. The Case For: The Ducks didn’t face a serious test in the first round, walloping arguably the worst team in the NCAA tournament, No. 16 seed Holy Cross, by 39 points. But their game against St. Joseph’s was a different story. Oregon surrendered a five-point halftime lead and trailed by seven points with 4:49 left. Ironically, it was in this spot that Oregon proved its worth as a No. 1 seed. The Ducks’ resiliency was tested, and they came through in a big way, closing the game on an 18–6 run to win. Oregon has otherwise played about as predicted so far. The Ducks are led by a balanced offense—four starters averaged in double figures during the regular season—and play just enough defense to stay competitive in close games and to preserve a lead late. Brooks’s continued emergence—he scored 25 points with an offensive rating of 125—gives the Ducks an MOP-caliber player who can take over any game. The Case Against:Against: St. Joseph’s was only the No. 44 team in the country, and Holy Cross was No. 264, so the Ducks have yet to be seriously tested. They will be, though, against Duke. Blue Devils coach Mike Krzyzewski, of course, has five national championships to his name, and he also has two of the best players in the country in freshman forward Brandon Ingram and sophomore guard Grayson Allen. Although the Ducks’ road to this point has been relatively easy, it will be treacherous moving forward. Oregon continues to struggle on the defensive glass, ranking No. 225 nationally. They are vulnerable against post-oriented teams and against teams that take care of the basketball. A lot of the Ducks’ offense is generated from fastbreaks off steals and blocks. SI Prediction: Beat Duke in the Sweet 16; lose to Oklahoma in the Elite Eight.